User Lists are a new feature of the NLA website. They allow you to save and annotate favourite library items. More Importantly, though, they allow you to share selected items with the whole world. Anybody can then email your list of items, or download them in endnote, bibtex, or marc-21 formatting for insertion into a referencing program. People can even subscribe to another user’s list and receive new items via RSS or email. Anyone can view public user lists. 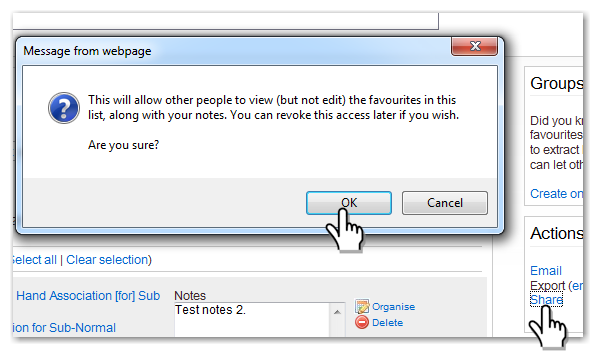 However, you need to be a registered user of the library to save items as favourites and then share them. Start by visiting the library catalogue. Log in by selecting the “Login” link on the top right of the page. Once you’ve logged in, you’ll see the option to “Add to favourites” towards the top right corner of item records. Once you’ve added an item as a favourite, you have the option to include it in a custom group (more on this later), as well as keep notes about the item. If you’re logged into the library, you’ll see a “Favourites” link in the top right hand corner of the screen when you’re viewing the catalogue. Click this to manage your favourites. The “Your Favourites” page lists all your favourite items. You can sort them by date added (the default), by author, and by title. It would’ve been handy if the Library had given us the option to sort them by date published. But they haven’t. From the Favourites page you can create a custom group by clicking the “Create one now” link near the top right of the list. You can name the group whatever you want, and add a descriptive note about the group’s contents. You can also choose to make the group public. If you’ve made a group public, you can make it private again at any time. 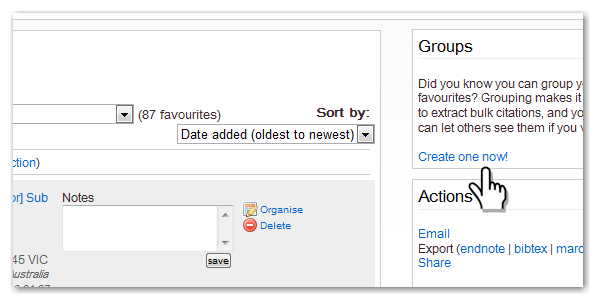 Once a group is created, you can add items to it by selecting the “Organise” icon to the right of the item. You can perform bulk edits by selecting the check-box to the left of multiple items, and then using the organise button near the top left. There are a few bugs with this at the moment, mainly related to having the same item in multiple groups, and the existence of the default “all” group. The most frustrating is the notes feature. The notes appear to be linked to the “group” rather than the item. So if the item exists in several groups, and you wish to add universal notes to it, you must amend the item several times, once in each group. One the flip side, this means that you are able to display different notes for an item in public and private groups. Also, the system appears to duplicate items on occasion. So far this seems to be random. Once you have a group ready to go, you can make it public by selecting the “share” link in the “Actions” box on the right hand side of your items. Once the group is shared, you have the option of “un-sharing” it. Next to the “un-share” link there will also be a direct link to your list: “view.” This is a stable URL, so you can then email the link, or post it to a website. Anyone can subscribe to your list via email or RSS, and receive new references as you add them to your group. What’s so good about user lists? Well, the possibilities seem endless. First, it allows you to quickly share large numbers of exportable references with anyone. You can also feed new items to subscribed users. So, if a number of colleagues from one department all subscribed to a user’s list, they could easily be updated via email of any new publications in a given field. Provided, of course, that the library holds the item. If you were willing to share your library log-in details with friends or colleagues, you could work collaboratively on a list. So if you were working together on a project in different states, you could all add to, annotate, and edit a bibliography in a team, with no special software required. Then, should you happen to be in Canberra, you have a ready list of items which can be retrieved at the click of a button. Perhaps, in the future, the library will make shared lists a feature. User lists also have great potential for NLA staff. User lists could be created for a range of research areas, and each list could be updated as new items are acquired by the library. This way, researchers from a range of disciplines could be easily informed about new publications in their field. User lists could also be useful for the Library’s exhibitions staff. For example, a bibliography could be created to accompany an exhibition. Having viewed an exhibition in the foyer, library users could then quickly access a range of books related to the display they had just seen. This might also be useful for people curating other cultural institutions in Canberra. For example, after seeing an exhibition at the National Gallery, visitors could be directed to a bibliographic user list. They could then stroll down the road to the Library and read about the art they’ve seen in a book. With the growing number of digital items in the library catalogue, anyone could create an online library or exhibition. So far, there’s only a handful of lists available. Evan Rowlands from Pagan Awareness has created a list of “Australian Pagan Books.” A chap called Ronald Besdansky has made all his favourites available (he seems into trams). A few staff members have also started creating small lists, mostly experimental. And I’ve started a list related to my research on the history of intellectual disabilities in Australia. Hopefully, over the coming months, we’ll get some more, and more innovative, lists posted.